Birken Forest Buddhist Monastery (‘Birken’) is supported solely through the ancient tradition of ‘dānā’ (‘generosity’ or ‘giving’), in the form of monetary and material donations, as well as voluntary labour. Generosity is a quality of the heart which the Buddha greatly encouraged for its benefits to the giver in this life and beyond. Unless they are clearly invited to do so, monastics may not ask for anything directly. Practically speaking, donations supply everything from food, soap and stamps, to generator fuel, building costs and insurance. 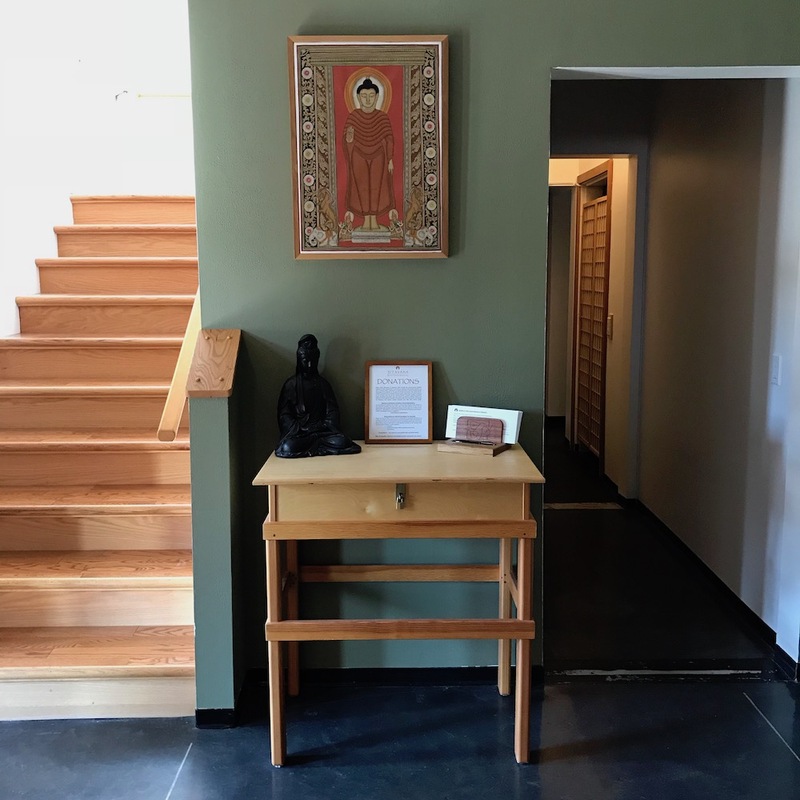 Your gifts enable the monastics to continue their work of training in, and sharing, the Dhamma, and support resident stewards who offer their services free of charge. This facility and its resident monastics have no outside means of support. Monthly or quarterly donations are especially appreciated, as the regularity helps to stabilize our financial operations. Anumodana – we rejoice in your generosity! Charitable Status: The monastery is a registered Canadian charity. Official Name: The charitable society is officially known as “Birken Forest Buddhist Monastery”. Registered Charity No. : BN 89263 5483 RR0001. 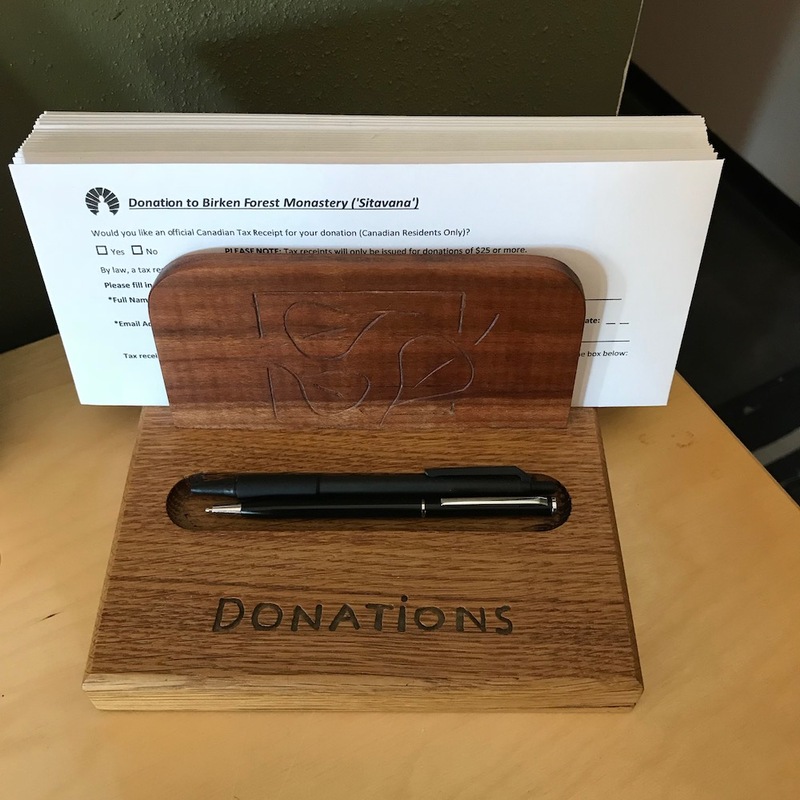 Please note: Birken Forest Buddhist Monastery (‘Birken’) has an Offsite Treasurer who is responsible for processing all donations and issuing tax receipts. If you reside in Canada and would like to request a tax receipt, you must provide your full name, residential address (including postal code), and email address with each donation. Our Treasurer does not have access to Birken’s contact database. Financial donations to the monastery are tax deductible in Canada and eligible for a Canadian tax receipt. While charities are under no legal obligation to issue tax receipts, we are pleased to do so for a minimum $25 donation IF we receive all the required information referenced above for each of your donations. If we do not receive this information from you at the time of your donation, it will be assumed that you do not require a tax receipt. If you donate electronically through PayPal or Interac email money transfer, please be sure that we have the required information mentioned above – you can email this information to our Offsite Treasurer at treasurer@birken.ca. CanadaHelps issues a tax receipt to each donor; you will not receive an additional tax receipt from Birken if you use this donation method. Tax receipts are normally issued electronically by e-mail, but can be sent by post if this is specifically requested with the donation. You can usually expect tax receipts to be delivered twice yearly: once in August, at the end of our fiscal year (for donations made between January to July) and once in January, at the end of the calendar year (for donations made between August to December). We may issue receipts earlier or later in some cases. Please note that we cannot issue tax receipts retroactively for donations made during previous fiscal years (Birken’s fiscal year runs from August 1 – July 31). Throughout the year, there are many individuals who donate anonymously or request not to receive tax receipts for their donations. The Birken community expresses its gratitude to these individuals for their generosity and rejoices in their good merit. If you have any questions or concerns regarding the issuance of tax receipts, please email treasurer@birken.ca. There are many different ways you can make donations to support the monastery. Donations by cash, cheque or money order can be made at the monastery or sent by post. If you have access to online banking with a Canadian financial institution, you may send money directly to our bank account through a secure Interac e-Transfer (email money transfer). If you prefer to use a credit card, you may transfer funds using CanadaHelps OR PayPal (these services charge administrative fees.) It is also possible to make non-monetary donations of material goods or labour. For more information, please feel free to contact our Offsite Treasurer at treasurer@birken.ca. You can make donations by cash, cheque or money order when visiting Birken Forest Buddhist Monastery. If requesting a tax receipt for donations of $25 or more, please write all the required information (full name, residential address (including postal code), and email address) on the front of your donation envelope, and then insert into the Donation Box located in the main foyer of the monastery. Many donors enjoy offering a prepared dana meal, food supplies, and/or material goods. Please consult our Food and Material Offerings page for more details and a current list of useful dana items. Physical labour or skilled labour are also valued forms of dana. If you have particular skills you’d be able to contribute to the monastery (e.g. carpentry skills, plumbing expertise, etc. ), please email us to inquire about possible opportunities to help (meditate@birken.ca). While you are here for a visit, your help with various volunteer ‘yogi tasks’ and the general upkeep of the monastery is also appreciated. You may send us an Interac e-Transfer (secure email money transfer) from your Canadian online bank account. – Login to your personal online or mobile banking account (participating Canadian financial institutions only). – Choose Interac e-Transfer within Transfer/Payment menu options. – Select a recipient by entering an email address: treasurer@birken.ca. – Fill in the dollar amount, account from which to withdraw the funds, a security question that the recipient will have to answer and an optional personal message (this is a good place to enter your full name, residential address (including postal code), and email address for tax receipt purposes). – Please note that our Treasurer does not reside at Birken and may not know you personally. Please keep your security question simple enough that she can guess the answer or send a clue by separate email. – Follow the instructions to confirm and complete the transfer. – There may be a small administrative fee for sending an Interac e-Transfer; it is usually a flat rate fee of $1.50 per transfer, but this may vary depending on your financial institution. CanadaHelps takes the fee directly from your donation and provides a tax receipt to you directly. There is a small administrative fee charged by Canada Helps at the time of donation (3.5 – 4%). Under “Options” select “Send a Gift” and your entire donation will come to Birken; no fees will be charged by PayPal. Should you select another option, PayPal will charge an administrative fee between 3 – 6%. Birken treats these fees as a part of our business expenses and we will provide you a tax receipt for the full amount of your donation.